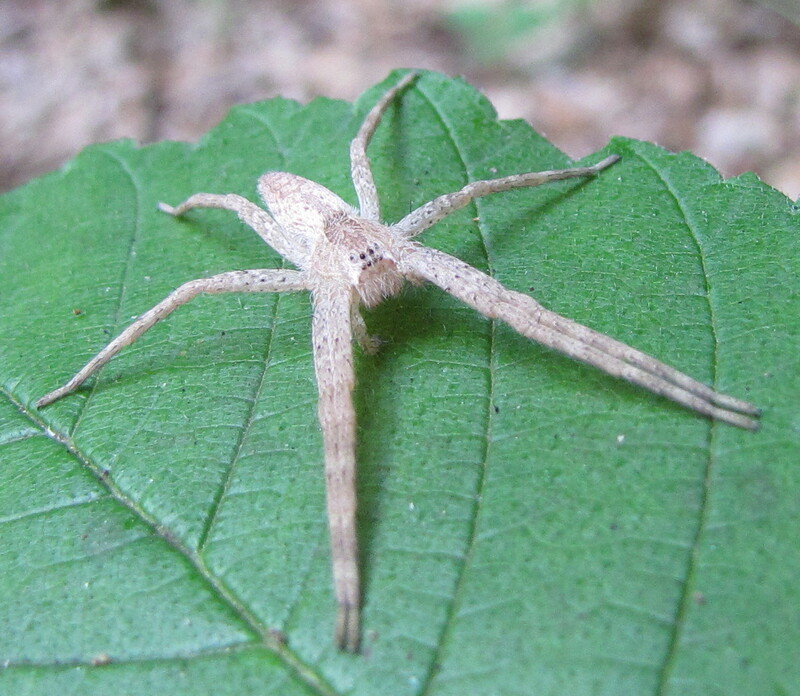 If Spiders.us had a top ten list for the spider species we are asked to identify most often, then the nursery web spider, Pisaurina mira, would certainly be on it. 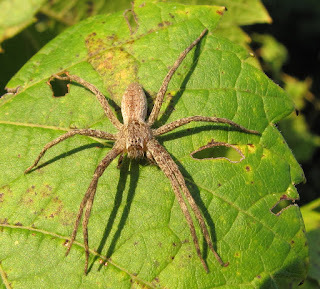 This is a large, abundant spider, especially in New England where there are lots of people who see it. This species also reaches adulthood in the spring, just when people are going out into their yards and gardens. You could not be blamed if you encountered one unexpectedly and decided you’d had enough of this outdoor stuff for the rest of the year. Female Pisaurina mira measure from 12.5-16.5 millimeters in body length, males 10.5-15 millimeters. They are “leggy,” too, so that makes them look larger still (35-45 mm legspan). 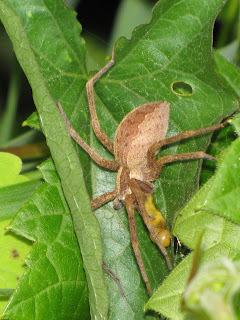 Members of the family Pisauridae are collectively known as “nursery web spiders” because of the habit of the female suspending her egg sac in a tangled web just prior to the spiderlings emerging. The mother spider guards both the sac and the spiderlings that hatch, until they molt once more and disperse. 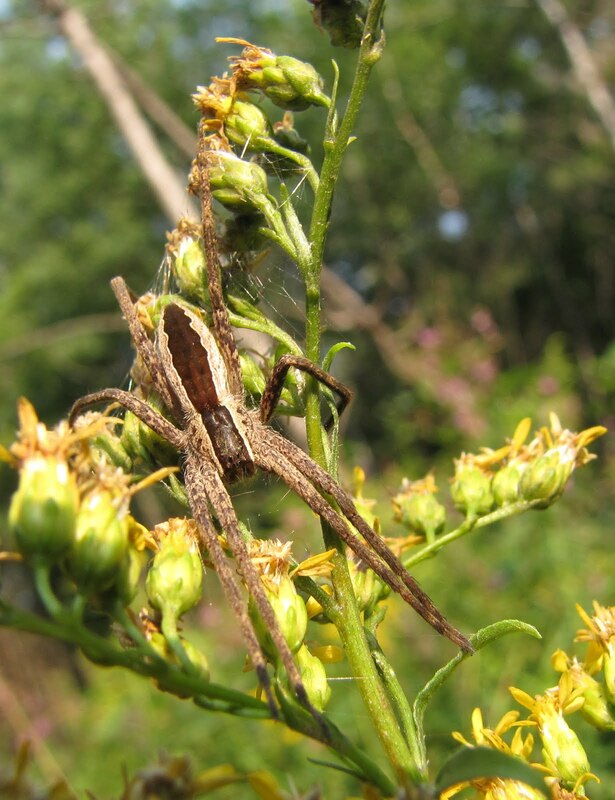 This web envelopes a small section of foliage, usually well off the ground in weeds or a shrub. 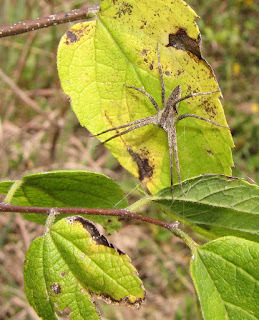 Pisaurina mira is a hunting spider that otherwise spins no web, or at most minimal “scaffolding” where it sits motionless in ambush on foliage during the day and/or night. They may also hunt actively, sometimes visiting outdoor lights to catch the many insects attracted to the artificial beacons. Despite their small eyes, they are superior at detecting motion, responding quickly to potential prey, or fleeing from perceived danger. Recognizing this spider is not always easy. Most mature individuals are light brown, beige, or grayish with a broad, dark stripe down the entire length of their body. Immature specimens, and some adults, lack the distinct stripe, however. The spider often rests with the first two pairs of legs held tightly together. Mating takes place in mid-summer. The male employs a silken “veil” to bind the first and second pairs of legs of his mate whilst they are both suspended from draglines. Each mated female prepares an egg sac, carting the white sphere in her jaws. 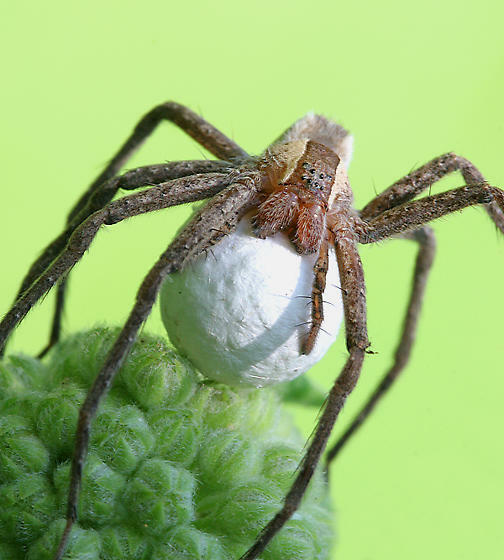 She eventually finds a suitable place to hide her egg sac, such as beneath a folded leaf, and shrouds the whole thing in her nursery web. Her young are the arachnid equivalent of teenagers by autumn, and they seek a snug place to overwinter. Inside cracks and crevices, and beneath loose bark or stones are good places to find them. 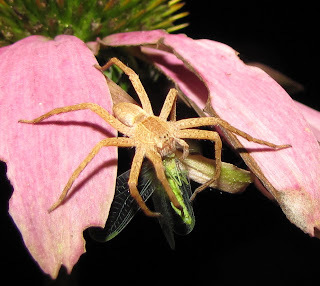 Despite their intimidating size, nursery web spiders are not considered to be dangerously venomous to people or pets. To the contrary, they are highly beneficial predators of insect pests in your yard, garden, farm or orchard. The species ranges from southern Ontario and Quebec in Canada to Florida, west to Minnesota, Nebraska, Kansas, Oklahoma, and the Rio Grande Valley of Texas. Look along forest edges in the understory, among grapevines, and on weeds in open fields. They can be mistaken for wolf spiders at first glance, but are much more likely to be found in the vertical plane rather than on the ground. The eye arrangement differs between the two as well. Pisaurina has all eyes basically the same size. Sources: Bruce, John A. and James E. Carico. 1988. “Silk use during mating in Pisaurina mira (Walckenaer) (Araneae, Pisauridae),” J. Arachnol. 16: 1-4. Carico, James E. 1972. “The Nearctic Spider Genus Pisaurina (Pisauridae),” Psyche 79: 295-310.
i caught one of these and it was in oerfect condition then it ate two of its legs. why is this?